Strap locks and booze jams :: the SG party foul — Chubbuck Guitars :: making & repairing Guitars in a old building just north of Boston, Mass. This is an older repair, but a good one. I was at a party with a bunch of friends and had a casual jam session. Well, more of a noisemaker session where we brought instruments to pass around while drinking. Usually making "music" and alcohol don't mix well. I usually bring my beater Warmoth Tele to situations like this as Tele's are just about as bulletproof a guitar you can find. My hollowbodies definitely stay at home on these nights. While at this jam session, one of my friends decides to take a break to step outside and sets down his Epiphone SG. Another one of our friends (who will remain anonymous), picked up the SG and put the strap over her head and shoulder. Getting ready to rock, she took her left hand off the neck for a split second and BOOM! The strap slips off of the strap button and the guitar comes crashing down on the hardwood floor, neck first. Just by the sound it made, I knew it was not going to be OK. It sounded just like splitting fire wood, if you have ever done so. I'll never forget the look of panic in her eyes as she looked across the room at me. She reaches down to pick up the guitar and the neck was completely broken free of the body, loosely tethered by the strings. Since she knew I was a guitar builder, she immediately asked me to fix it. I kind of laughed because I was still in shock myself by how fast things went down (literally, "down"). I told her that I was not going to be able to do a quick fix before the owner came back inside. This one needed a trip to the ER. You can see from the picture above that the neck snapped off clean, which is good for a solid reglue. The only parts that chipped off were pieces of the finish. When I got it back to the shop, I taped off around the proposed glue joint to help contain the squeeze out. My glue of choice in this situation is West Systems Epoxy. This stuff is marine grade, serious adhesive. Plus it gives you adequate working time before it sets so you can make sure everything is clamped and aligned properly. Once I applied the epoxy it was just a matter of aligning and clamping up the joint. I always do a dry run first before gluing so I can double check that my proposed clamps / cauls will work and that the joint will close tightly without excessive pressure. With the epoxy spread onto both surfaces and clamps set, I cleaned up the excess epoxy with a paper towel dampened with acetone. 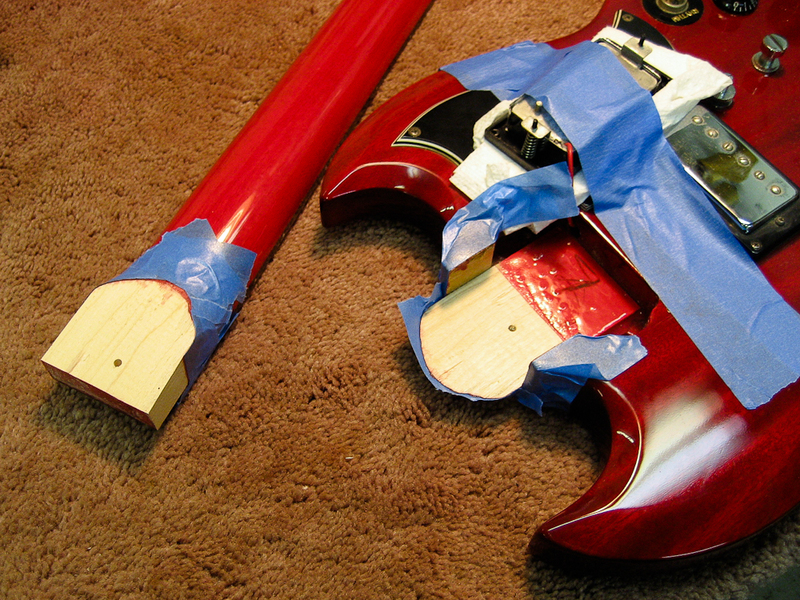 Then I pulled my masking tape so the epoxy didn't bond the tape to the guitar. Since the finish is catalyzed and insoluble with acetone, I continued to clean up the small amount of epoxy squeeze out that remained. The guitar was then left to sit overnight while the epoxy cured. The cure time on my mix was 8 to 12 hours. I like to keep the leftover epoxy from a batch to see how well it cured before pulling the clamps. Note: you can test finishes by pulling a tuning machine and experiment within it's footprint. The glue up went very well. The color layer had been chipped when the guitar met the floor and we decided it was not worth the time to do any color work. I did however use superglue to fill in for the missing finish. Once sanded and buffed, you can't tell by feel that it was ever broken. I was very pleased how well the repair came out and the owner was glad to have his old guitar back. Also worth mentioning that there is no "bad blood" between the SG's owner and the girl that dropped it. One of biggest recommendations that I can give players is to install strap locks on their guitar. They come in a variety of styles and are one of the least expensive things you can do to protect your instrument. Strap locks will ensure that your strap stays connected unless you want to remove it. My personal preference is the Schaller / Gotoh security locks and they are standard issue on all of my hollowbody builds. One more often overlooked item to protect your guitar is a solid guitar stand. It drives me nuts when players spend all of this money on their guitar and then cheap out on a stand. You need to have a secure place to put your guitar down. No leaning it against or on your amp! If it is not going back in the case, my recommendation is to pick up any of the Hercules stands. They are rock solid. A player just told me this past weekend about an incident with his acoustic on a Hercules. He was up on stage and the piano player had to run around stage in the middle of a song. He accidentally kicked the acoustic on his way past and the stand slid back, tipped a bit, then came to a rest. Not saying that a good stand will save you from all the rambunctious pianists out there, but it saved the day in this case. Oh, and while I'm at it, please unplug the guitar before you put it down! I see so many people get hung up on a cable and taking guitars on an epic journey across the stage. Pretty funny to watch though - unless it's your guitar. "Treat your guitar well and it will love you in return." And think twice about which guitar to bring to your next booze jam.